Sometimes you are just too busy to get things done before the last minute, but hey, it doesn't bother you. I just like you am the victim to procrastination. No matter what, I always seem to be doing everything at the last minute. I feel like it's the only time I have to do anything because minutes seem to fly by and the next thing I know I have an assignment due the next day. But instead of trying to break this habit, I've learned to relish and actually allow it to help me. If I have two tasks I need to get done, and a short amount of time to do, I decided on which one to do first by the amount of time it will take. For example, If I have two things due around the same time and I know I can do one of them in a short time frame, I save it for that short time frame. If I have to write a paper and I am finishing it up until class starts, but I have an assignment due later that day, I will do the shorter assignment later. That way I know I have enough time for the longer assignment. There is a difference between procrastinating because you are in bed watching American Horror Story and procrastinating because you always find yourself too busy to find the time to do anything. If you suffer from the latter, because you work all weekend and have a million and one extra-circular activities to attend too, that's what I call positive procrastinating. Positive procrastination is something you can strive off of, it's really a gift so don't let it get you down. You can do it and really all you need is some last minute time management and you are good to go. If you have a huge paper coming up and its worth 50% of your grade, write it down in your planner a week ahead of time. That way you convince yourself its due before it really is and you can have time to edit and make it perfect. This will limit the amount of "behind" you are and will allow you to get some task off your to-do list. My tricking your brain into the new date, you'll actually be ahead and allow for more time on other procrastinated assignments. 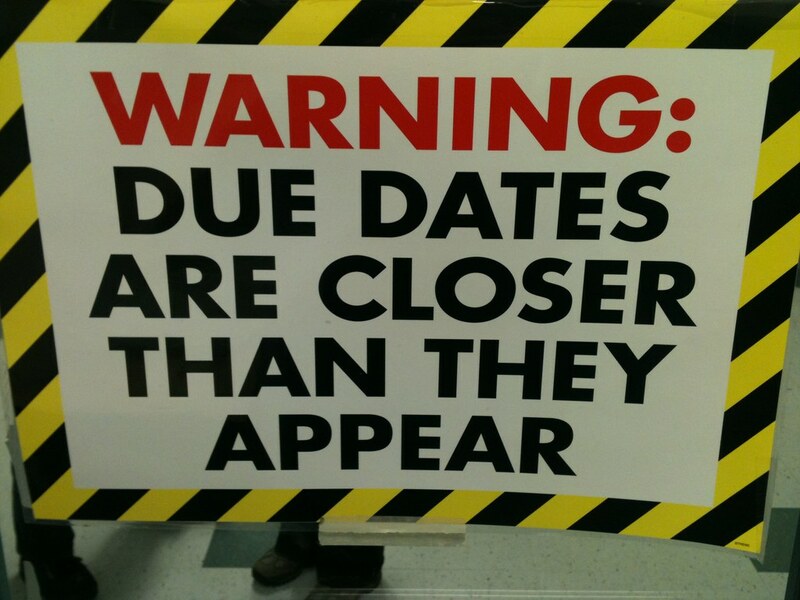 You might still procrastinate up to the fake due date but hey at least you got time. This is really the story of my life, no matter how hard I try I always end up working on assignments till the last minute. I am frequent flier of the "Printing five minutes before class" plane. A lot of people don't understand why though, It's simple, it's really an adrenaline rush wondering if you are going to make a deadline. It's 11:58 pm and your quiz is due at midnight and you have one question left, boy does that just get you going. I get it. Some people really strive when they wait till the last minute, congratulations that's a life skill that you could probably throw on your resume. There is a lot of pros of being a professional procrastinator. For example, you are good at multitasking. You can get two tasks (that you forgot to do, of course) done at the same time. You are also a hard worker because you always have to work extra hard to get everything done all on time. There is also the fact that you can handle the pressure well, let's say you really do mess up a deadline in the real world, you have been procrastinating since kindergarten and can handle it like a boss, so it doesn't faze you, and that work project gets you promoted. You're welcome. Not to mention you also feel like a boss when you conquer your forever growing to-do list, and that's really a confidence boost. Get back to work and just know, procrastination isn't for the faint of heart. "You know you don't make that much money, right?" Yes, I want to be a teacher. Yes, I know what the salary of a teacher is like. Yes, I know that people will view my future career as “easy." No, I would not want any other job in the world. I am sure that I am not the only future educator who has had enough with hearing all the critiques about becoming a teacher, we are tired of hearing all the negative aspects because it's obvious that the positives will ALWAYS outweigh those judgmental negative comments. So, why do I want to be a teacher? I am sure that I speak for many other future teachers when I say that I am not doing it for the salary, benefits, or even the summer vacation (although that is a great plus!). I want to be a teacher because I will be able to wake up on Mondays and actually be excited. Saturday and Sunday will be a nice break to relax, but I know that I will be ready to fill up my apple-shaped mug with coffee on Monday morning and be ready for a day full of laughs and new lessons for my students for the upcoming week. I want to be a teacher because I get to have an impact on tomorrow's leaders. No, I don't mean that I'm predicting my future student to be the president of the United States (but, hey, that would be a pretty cool accomplishment). I mean that I have the job to help students recognize that they have the power to be a leader in and out of the classroom. I want to be a teacher because I don't want an easy day. Challenges are what push me to greatness and success. Although many people think teaching is an easy profession, I know that it isn't easy. It's very hard, every day at every moment. But it is worth it when a student finally understands that math problem that stumped them for a while and they have a huge smile from ear to ear. I want to be a teacher because I want to work with kids. I mean, come on, what else is greater than a kid having fun and you're the reason why? A picture might be worth a thousand words, but a child being excited and having fun while learning is worth a million. I want to be a teacher because I don't want a high salary. If I really cared about making a six-figure income, I would have chosen a different profession. Teaching is not about the check that I bring home every week or two, it's about what I learn and the memories that I make, the memories that I get to share with my family at dinner that night. I want to be a teacher because there is nothing else in this world that I'd rather do for the rest of my life. Sure, there may be other jobs that are rewarding in more ways. But to me, nothing can compare to the view of a classroom with little feet swinging back and forth under a desk from a student learning how to write their ABCs. Teaching may not be seen as the perfect profession for everyone, but it is the perfect profession for me. While it's one of the greatest police forces in the United States, it doesn't come without its challenges. I decided to apply for the California Highway Patrol in 2015. I believed with my background in the Air Force as Security Forces, I would be prepared for the tough demands that came with a paramilitary training environment. Unbeknownst to me at the time, the CHP's methods of training were closer to the Marines than the Air Force. I understood this from the start of the grueling and in-depth application process for the academy. Although I had a mental understanding of the challenges coming, I was not as prepared as I believed myself to be. If you are considering applying for CHP (or any police force for that matter) here are 10 tips to keep in mind for that first day. Be aware, within the first week of training, on average between five and 10 cadets will drop out. On my first day, one person decided to not show up at all. 1. Mentally preparing yourself is the key. The training environment at the academy is controlled and relatively safe. The average cadet is in no real danger throughout his/her stay as long as the cadet pays attention to detail. That being said, a lot comes into play when starting at the academy. Unlike other police academies, the CHP is a live-in training environment, meaning the cadets that get into the program will live in dorm rooms with other cadets five out of seven days. They are away from the familiar and subject to strict rules set in place. There are cadets that come with a military background and can handle this change. There are others that can break because of the added stress. The key to surviving the mental battle is to take it one step at a time. In my case, it was one meal at a time. 2. Chow time doesn't mean you get to relax. Where the majority of people find that food calms them or relieves stress, the cadets find those times as probably the most mentally stressful. There are two ways to get to the dining facility on the grounds: the main path being directly in front of huge glass windows to the Staff Office. This office is housed by CHP officers in charge of day to day goings-on at the academy. They also ensure the mental and physical torture of the cadets on a daily basis for their own amusement. Of course, if you are not the subject of attention, the blow-up is amusing. However, the cadet that is circled by five or so officers like they're in shark-infested waters feels anything but humorous. From the window of the staff office, officers can see the endless line of blue-uniformed cadets walking to chow. They can see if cadets are talking, out of step, looking sloppy or acting nervous and awkward. Once an ideal target has been identified, the officers go in for the kill. Other times, the staff officers are loitering the path to chow and stopping cadets at random to ask an array of knowledge questions. Cadets have to always be prepared for the unexpected and chow time is one of the opportunities the staff office will use to gauge how much cadets are studying or retaining from the training. 3. Physical training is a different kind of fun than you're used to. Being physically fit is part of being an officer. Yes, there are officers that have let themselves go for the worse. However, at the academy, letting yourself go is not acceptable. The physical training standards are tough and the instructors expect cadets to be at their prime shape while at the academy. Prior to attending the academy, there is a physical performance test that applicants HAVE to meet in order to make it one step closer to being accepted into the academy. The standards on applying are not anywhere close to the physical training regimen cadets undergo throughout their six months of training. PT is completed in the early hours of the morning before the sun decides to make its appearance. Training consists of calisthenics and running. The instructors are preparing cadets for the graduation run, a five-mile-long run to the Capital. An average PT session will include the standard push-ups, jumping jacks, mountain climbers and sit-ups. There will be times when a PT instructor wants to have fun with a class and come up with some new method of physical torture. 4. Be willing to accept tough criticism. Part of the process of the academy is to prepare cadets for facing disgruntled citizens on the road if they are ever so fortunate to graduate from the academy. The training environment is controlled, so cadets only experience so much. It is the staff officers' job, as well as other training officers, to be tough with cadets. This helps gauge how soft or hard a cadet is and if they would be taken advantage of on the outside or if they could handle themselves. Staff officers will use that opportunity to critique cadets from their uniform to the hairs on their face (or nose/ears). The officers watch with a stern eye to look for any weakness and to exploit it and hopefully, make the cadets turn it into a strength. There are cadets that cannot handle criticism. My advice to those individuals is to listen to what these men and women have to say, don't question it and as long as it is not unethical, illegal or immoral, do what they ask (or demand). 5. Learn to accept that there is no such thing as personal space. From the very beginning of the academy, I had to accept that I would be getting close and personal with the other cadets. While waiting in line, in formation, in the classroom, during PT or when a Staff Officer decides to get in your face, the personal space or bubble is non-existent. I remember on our first legitimate day after week zero (or otherwise known as the stress-free week) the entire class was lined up. My front was literally on someone's back and the person behind me was on my back. These two classmates ended up being my neighbors in class and during PT. You can say that we definitely got familiar with each other because of that day. 6. Dorm living is just another part of life. Part of the academy involved living on the grounds for the week, with weekend liberty starting Friday and returning Sunday night (if you were so fortunate as to live close enough to go back home). There were cadets that required flights to go back home. I was fortunate to live just 40 minutes from the academy. Living on the grounds meant abiding by the dorm rules. For the most part, the rules were pretty basic: maintain a clean living area, make the bed, line up the shoes, keep your locket in order, no personal belongings outside of the locker when no one was in the room and absolutely no food in the rooms. The staff office provided the class with a Standard Operating Procedures (SOP) book, outlining all of the rules and how the rooms were to be maintained. Therefore, no excuses were allowed regarding breaking any of the aforementioned rules. Another thing, we were subjected to room inspections whenever the staff office saw fit. This gave cadets enough incentive to maintain the rooms as written in the SOP. 7. First impressions are lasting. The CHP is known for their sharp uniforms and driving skills. In the academy, we are taught that first impressions can make or break us. In a job like the CHP, it could make the difference between life and death. How we look to civilians tells them a lot about us. If we are overweight or sloppy they see us as weak and easily taken over. If we are sharp and in shape, we exude confidence and control. The staff office will use the same thought process on cadets. They look for everything: ironed and pressed uniforms, clean and polished boots, that your belt buckle is lined up with your pants and blouse buttons, that your hair is in order (male and female), you maintain your facial hair, you're free from food stains, you have your gear and the list can go on. The staff office's mission is to prepare the cadets as much as possible for the outside with the end goal being to go home after every shift. As an officer, that first impression can make the difference. 8. Expect yelling, and lots of it. If you are the average civilian with no background in the military, and your parents coddled you, you are in for a very rude awakening upon stepping onto the CHP academy grounds. A lot of parents nowadays shelter or baby their children and those children grow up to be adults that cannot function once someone gets in their face. In the CHP, there will be a lot of in-your-face experiences with the staff officers. They don't do it for their own amusement, but to get you, the cadet, to maintain your exposure and bearing when faced with an irate civilian. The yelling has a purpose. Keep your composure, keep calm, answer the officer professionally and that officer will allow you to carry on. Break, and they will all jump in. There is no way around it. 9. Approaching the Staff Office is exactly as complicated as you think it is, but it isn't as intimidating as you think. There are many stressful situations the average cadet can experience while attending the academy. One of the most stressful for some cadets is making that first approach to the staff office. For me, every time I had to approach the staff office, I went over every step and rehearsed the exact verbiage that was expected up to the part where they tell us to step up. I will be the first one to say that we overthink the staff office and it is not as hard or intimidating as we make it out to be initially. There is a process that is mandatory to follow and the officers will watch you like a hawk eyeing its prey, waiting for any misstep or saying something off-script. Cadets enter the staff building and will make their way to the staff office door that is labeled "cadets only." Once there, stand parallel to the table with your boot toes right in behind the line where the carpet meets the tile. Knock on the table loud and clear, stating "Cadet so and so at the staff office" then wait for further instruction. There are a few ready-made phrases we will need to say depending on the situation such as, "I have information," and, "I have a question," or reporting as ordered. The officer will step up to the window, give you a hard look and say to proceed. This is where it gets tricky. You will need to take two rather large steps forward, make a turning movement to face the door, make a side-step to be center with the window, stare pass the officer (never look them in the eye) and state, depending on gender, "Sir/Ma'am, cadet so and so at the staff office (insert one of the necessary phrases)." They will instruct you to continue and when the dialogue is complete, there is another process to leave. Be mindful, you will be watched until you walk off. If you make a mistake, it will be addressed. 10. If one person fails, everyone fails. 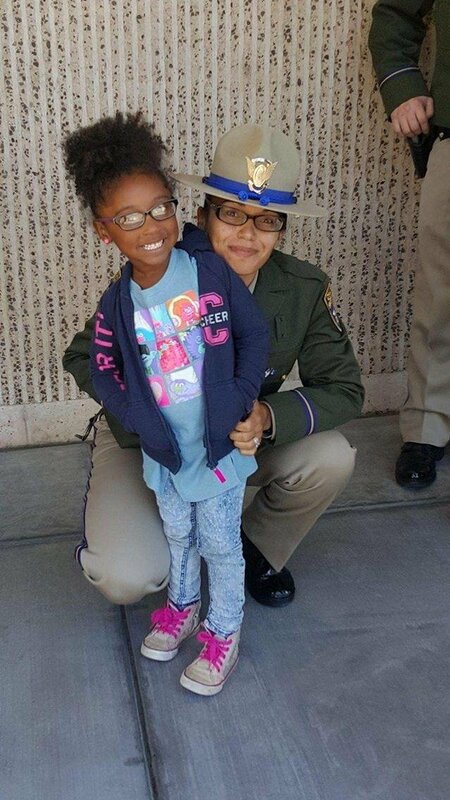 Like the military, the CHP is considered a sisterhood/brotherhood. We are each other's support. In the academy, we learn this the hard way. 150 or so cadets are thrown into a room and expected to work together with no issues from day one. It is a lot harder to do since each person comes from a different walk of life, different mentality and different way of doing things. Some people are team players and others are more independent. When at the academy, cadets have to forego the individual mindset in order to be successful. It can be hard for some to accept and that is when they will face the most challenges. If one is too slow during PT, the entire class is too slow. If a cadet cannot fill out the paperwork correctly, the class will be outside in push up position until that cadet completes the forms correctly. There is no such thing as "I" when at the academy. I entered the academy February 2016 and failed out at the end of July 2016, just a few weeks shy of graduation due to not meeting the demands of the driving course that is set out for CHP cadets. A month after my expected graduation (had I passed), I was able to go back to the academy and graduate with the next class (CTC 2-16). My second time around did not make it any easier when it came to weapons training and driving, but it did give me a better understanding of what to expect at the academy compared to my first time. Having that academy experience does not guarantee success. I have heard of some cadets going through three or four times until they finally graduated. I was fortunate enough to not need that third or fourth time. I learned not long after graduation and reporting to my office that I did not have what was needed to make a great officer and ended up not making it through Field Officer Training. Despite that, I am extremely grateful for the experience I gained.